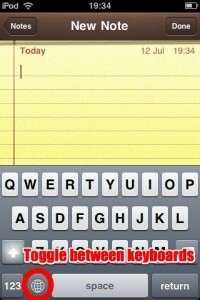 UPDATE: As of iOS 4.2, you can now change the font via Settings > Notes. No hacks required! If you don’t like Marker Felt, the default font used when writing notes in the Notes application in iPhone OS, you can actually write in a different font. It’s not a feature that is exposed via the user interface — in fact it seems to be something that is an unintended side effect rather than a feature. First, you need to enable the Japanese QWERTY keyboard. From the home screen, go to Settings > General > Keyboard > International Keyboards. 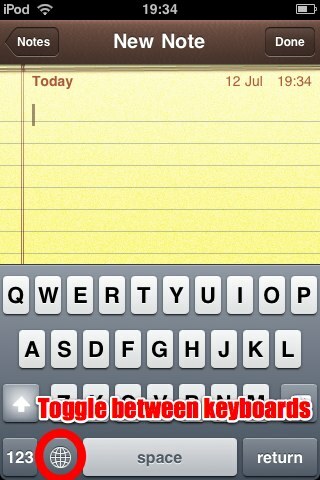 Now scroll to Japanese, tap it and switch on the QWERTY keyboard. Now fire up Notes and make a new note, or edit an existing one. Press the globe button at the bottom left of the keyboard to switch over to the Japanese keyboard. Then type a character — doesn’t really matter which one — and immediately press the globe again to switch back to your default keyboard. The rest of this note will be beautifully typeset in Helvetica.